I was thinking of the time I was learning and how important muscle memory is to help you stabilize your body as you do your best to hold an angle. My setup at a local restaurant. 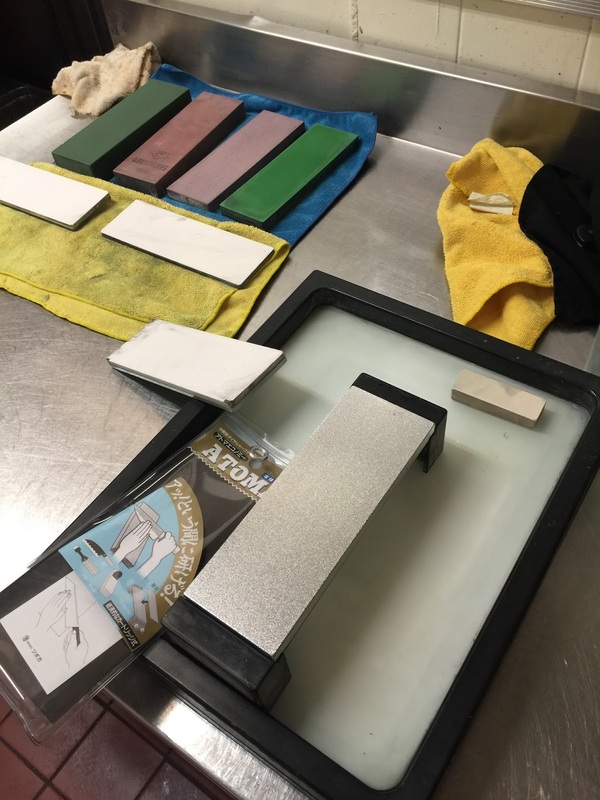 Atoma 140 diamond plate for flattening. Here is a good exercise for you, the purpose is to build up some muscle memory at an angle you choose, an angle that makes the knife sharp. 1. Paint the edge/bevel of one side of the knife and hold the knife at an angle that results in the removal of the sharpie when you run the edge of the knife over the stones, you can do this until all of the sharpie is gone. Really focus on holding the angle from the tip the heel, you will need to concentrate and focus on consistency, it is really the crucial component of successful sharpening, consistency. 2. Once you have that done, repeat the process on the other side of the knife, so paint the edge/bevel and do the same. Now if you just want to do the same side a few times to get the hang of it that is perfectly fine, in fact it may be even better for you, get that angle down, do it three times and then flip the knife. You will be pleasantly surprised at the results. Where I spend much of my day, every day. Don't get hung up on the actual angle, i.e. the number, 19 degrees, 20 degrees. Instead, get hung up keeping the angle constant as you sharpen, on both sides. The sharpies visual clues will guide you and keep you on track. As you do this exercise, just use minimum pressure, just enough to control the knife and you will find that the knife will become very sharp.